Our navel orange crop this year provided hundreds of oranges—maybe 500 or more; plenty to share with friends and family and enough to have orange juice most mornings and make sixty jars of orange marmalade. So as the season winds down and a opossum and possibly a hooded oriole are diminishing the crop, we picked the remainder for final uses and distribution. A sampling of the navel oranges. I keep a file of recipes clipped to use the oranges and occasionally add something to Pinterest but a trip to Trader Joe’s inspired me to try something new. Moist and sweet describes these orange jewels. Sampling them sent me searching for a recipe. 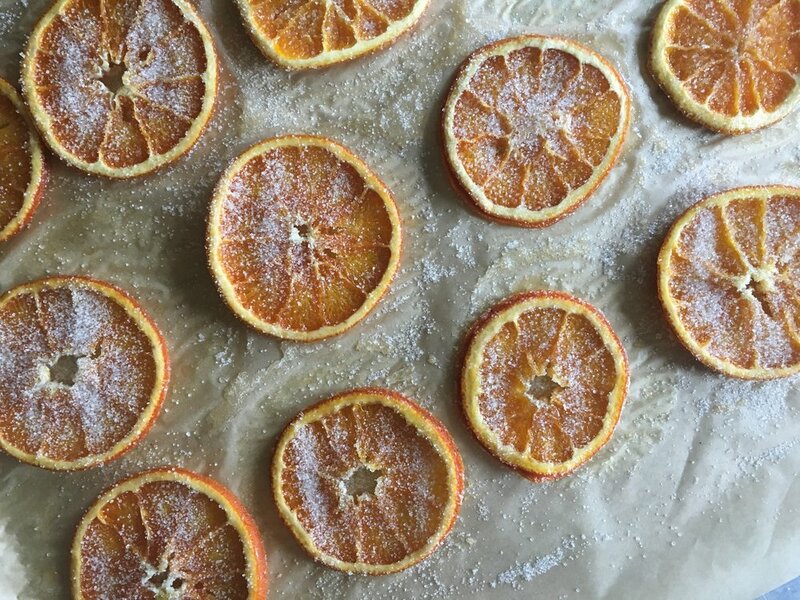 I found Lightly Sweetened Oven Dried Orange Slices and made only a few changes. I used Trader Joe’s Organic Sugar for the perfect small crystals with a hint of molasses. I didn’t add any cinnamon, ginger or sea salt. Do cut the slices very thin and roll the edges in sugar before placing on the parchment. Sprinkle the slices with the sugar and bake at 200 degrees F for about three hours. I forgot to take a photo before putting the orange slices in the oven so the orange syrup had formed. 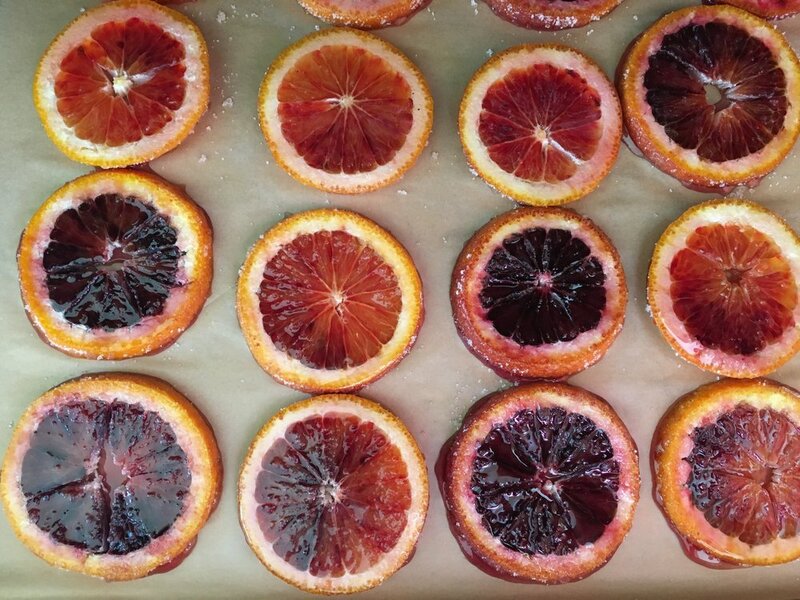 I also bought some blood oranges to dry. A gorgeous color and flowery flavor notes. Sprinkle the dried slices with a bit more sugar and store in an airtight container and enjoy within a week or two.